Garage Door Repair Buffalo Grove, Il | Overhead Garage Door, Inc.
Buffalo Grove is an area made beautiful by the well-kept homes in which residents live. 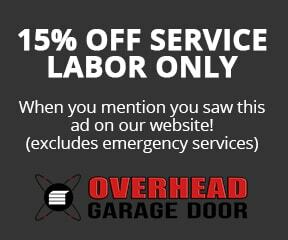 Overhead Garage Door Inc. is proud to serve the people in this area, and help them keep the city looking great. Our excellent customer service is sure to please, and we carry an extensive stock to help you customize your home. Add in our knowledgeable technicians to perform repairs and install hardware, and we are sure that we have what you need. Take a look at what we have to offer, and then give us a call. When you hire our services, we understand that our work should be centered on your needs. No matter what kind of schedule you have, we can work out appointments to suit you. We know that your time is important, and when you arrange an appointment with us one of our technicians will arrive promptly and ready to help with whatever you need. As a part of our dedication to service at your convenience, we also carry a large stock of garage door options. With so many choices available in one store, we are sure that we can help you find the look and features you desire at a price you can afford. Buffalo Grove garage door repair and installation what we do and our satisfied customers are proof that we do it well. The garage is a large and often very visible part of your home, and choosing a door can affect both security and curb appeal. We enjoy helping families make this important decision and put it into action. Take advantage of our friendly expertise when you need garage door repair in Buffalo Grove, and you will be happy that you did. Garage doors control the appearance, energy efficiency, security, privacy, and convenience of your home, so don’t limit yourself to a small selection. Investigate all of your options and make an informed decision. If you need help consulting about your specific needs, we will be glad to help. Give us a call today, and take the first step toward finding the garage door for your home.